Ciel, Sebastian and Snake board the luxury liner Campania on her maiden voyage to investigate the mysterious Aurora Society, who is rumored to perform experiments to raise the dead. Onboard the ship, is also Elizabeth, her older brother and parents as well. While sneaking on a meeting of the Aurora Society, where they have a short meeting with Undertaker, Ciel and Sebastian witness doctor Rian Stoker use a machine to reanimate a dead woman, who starts attacking the attendants. 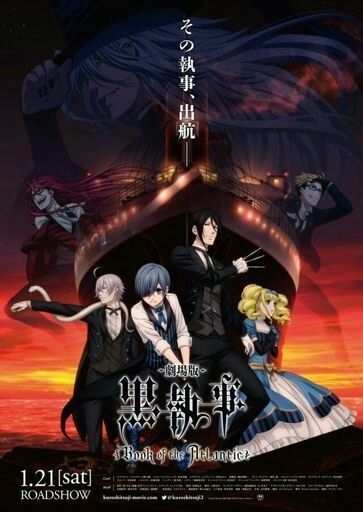 Ciel chases after Stoker but meets Elizabeth and Snake instead on the ship's cargo, where they find several other reanimated corpses who attack them, but Sebastian appears in the nick of time to rescue them. Once interrogating Stoker, Ciel discovers that a larger batch of corpses is stored in another place of the ship, as they also awaken and attack the ship's crew and passengers. Amidst the chaos, the ship crashes on an iceberg and starts sinking. Read more on Wikipedia.